Here's what to eat and drink at one of North America's best ski resorts. Bar Oso at Whistler. All photos by Leslie Kelly. It’s been an amazing ski season so far up on Whistler Blackcomb, buried under the white stuff. Still, as tempting as the vast snowy terrain is at what’s arguably the best ski resort in North America, you’ll almost always find me off the slopes -- getting pampered at a spa (tranquil Scandinave and the bliss-inducing spa at Nita Lake Lodge are two faves), or shopping in Whistler Village, and especially eating and drinking in the Village or nearby. Here’s what’s new and cool as we head toward spring skiing and the busy summer season. Aura is the handsome new restaurant at Nita Lake Lodge, the popular hotel located in Creekside, just a couple of miles from the main village. 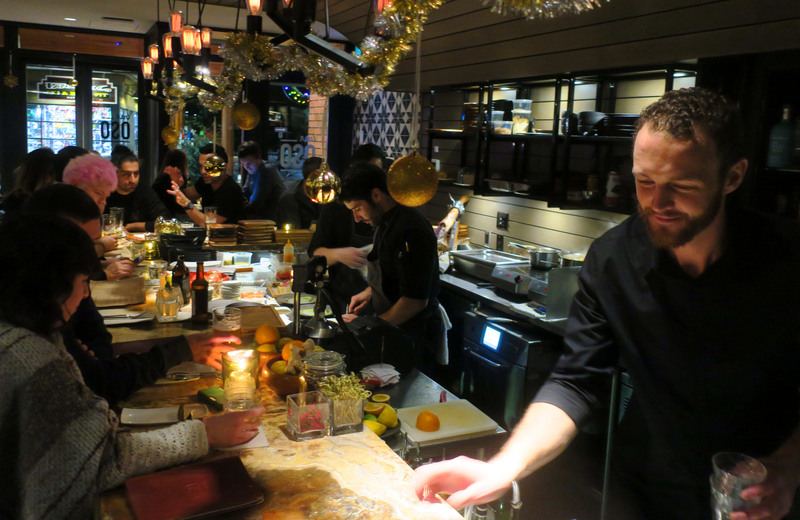 Its menu and open kitchen have a Vancouver feel, with impeccably sourced ingredients shining in creative preparations. Ask the excellent staff for recs. You won’t be sorry if you go for the ultra-creamy burrata and honey roasted beet salad for starters, followed by the richly flavored lamb duo (a thick chop and braised neck meat). Clever cocktails come from the lively lobby bar, Cure, also one of Whistler’s most popular apres ski spots. The winning team behind award-winning Araxi just launched il Caminetto steps from the Village gondola in a space that’s as stylish as its big sister, though a little more romantic. If you’re in the mood to celebrate a big day on the slopes, go large with the shareable ribeye steak, also known as bistecca alla fiorentina, or get your carbo load on with one of the house-made, Insta-worthy pasta dishes. Make mine that classic, stacked-layers-high lasagna, K? Another new development from TopTable’s stellar restaurant group: The crazy good tapas place, Bar Oso (see above), is now serving lunch, including Spanish-style sandwiches on house-baked bread. Portobello’s in the Fairmont Hotel has been packed since it opened late last year, especially mornings, as Gortex-clad skiers and boarders line up at the tempting pastry counter for something sweet to go with their eye-opening latte. Those cinnamon rolls baked in terra cotta pots aren’t just adorable, they’re mighty tasty, too. Go ahead and indulge because you’re gonna be burning off those calories carving turns. Your breakfast at Fifi Bistro's should definitely include a Caesar, and p.s., only Americans call these delicious drinks "Bloody" Caesars. There will be a long line if you hit Main Street Noodles during the lunch rush. That’s because this newbie, a short stroll from the Village gondola and lifts, delivers big bowls of made-to-order goodness at a great price. From Thai curry with rice noodles and satay on fat udon noodles to its signature rice bowls. Diners have a lot of room to be creative, too, picking proteins and spice levels. I love that the four-star is called (WO)Man Up! Skip the wait and order online for take-out.